Our son must have been bitten by a radio active spider or something because he has suddenly turned into a baby spiderman. (For all the non comic book nerds out there that’s an Amazing Spider-Man reference.) As I mentioned recently, you never know when your child is going to decide to surprise you by doing the unexpected. Sometimes, the unexpected is something awesome (and safe) like sitting up on their own for the first time, or learning how to crawl; other times it’s something that’s still pretty awesome, just not very safe. I love the fact that as Noah get’s older, he gets more and more curious. 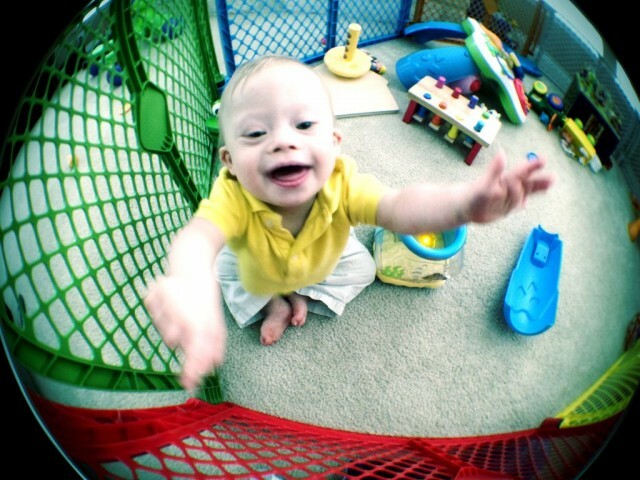 He loves to explore and try to solve problems in creative ways. 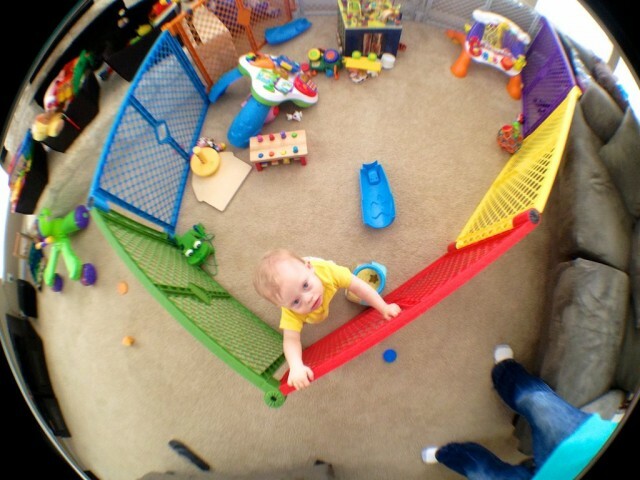 (Like moving his toys to the windowsill so he can use them as stepping stones in order to climb on to it.) I’ve already mentioned how our son reminded me of a Muppet Baby, and it’s a ton of fun watching his little brain go a million miles a minute as he learns new things every day. Don’t you just love this little face? I sure do! I hope Noah keeps his sense of curiosity and exploration his entire life, especially since adults often lose it; which is a shame. As Noah gets older, and becoming more and more curious, my wife and I find ourselves saying “No” more and often. We try to make sure our Yes’s far outnumber our no’s, and that we celebrate more than we discipline, but still it’s getting to the point where we’re having to lovingly help our son learn that his choices have consequences. That climbing over the gate may be sort of awesome (in a manly-guy sort of thing) and yes, it shows off how strong he is getting, but it’s also dangerous. On the other side of that gate is a floor. Ouch! 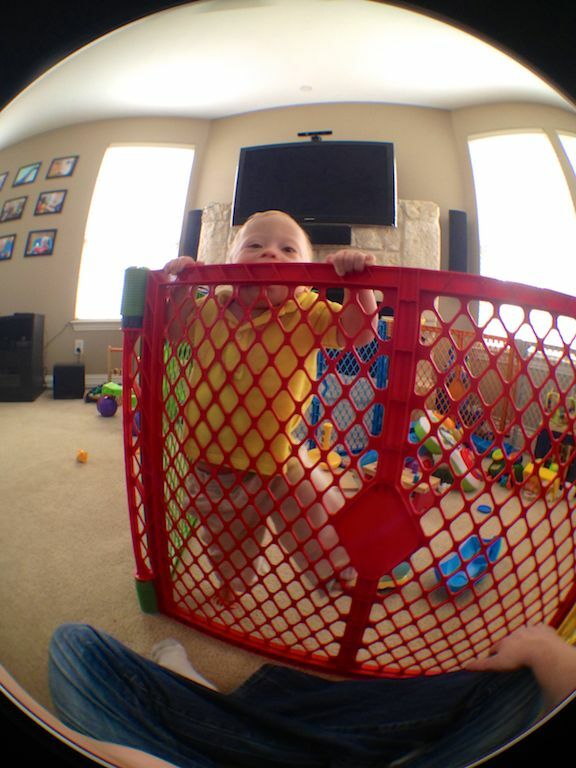 As you can see in today’s video, he thought No meant more (which by the way was the first sign he learned) and so he kept climbing up his play gate. So we have a few things to work on. But it’s all good. You take parenting like you take everything else in life, one day at a time. And we’re having lots and lots of great days in this house with this little guy around. Awwwww….Isn’t it fun to be a parent? What age did you first telling your child “no?” What are some ways you’ve helped your child learn what no means? And…does anyone else’s child ever attempt to escape from the baby jail (aka – the baby play gate?) Leave a comment below and tell us about it.